Sometimes I ask myself some odd questions, and one of them, when thinking about our recent Mexican ice cream flavours, was whether one could candy chilli peppers in the same way one candies orange peels. They are a fruit, after all. The answer to this is of course you can, and they are strangely addictive. We put them into ice cream as an inclusion for the food festival, but we also snacked on them over the course of the week. 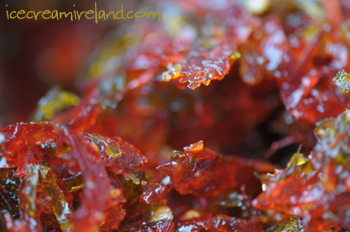 If you want to make something different, and like spicy things, give them a go! (They also look quite dramatic as a decoration – especially if you combine red and green chillis). Please note: you would be wise to use plastic gloves when chopping the chillis, or at the very least make sure you wash your hands carefully afterwards. If you absentmindedly rub your eye before doing so (as I have done), you will have a very unpleasant reaction. 1. Cut the stems off the chillis, then cut them lengthwise. Scrape out seeds, and chop them into narrow, half-round strips. 2. Combine the water and sugar and bring to a boil, stirring until the sugar is dissolved. 3. Add the chopped chillis and cook over medium heat for about an hour, topping up with water as needed to keep from burning. 5. Using a spoon or spatula, spread the chillis on a baking tray, and bake at 200C for about 5-10 minutes to dry them out. They should darken slightly but not turn brown. 6. Remove from oven, cool, and enjoy! That’s a really interesting idea, may have to give it a go. I imagine the syrup would also go well in a sorbet or as part of a mexican inspired cocktail. What a brilliant idea!!! I love it and will totally do a red/green combo coming up to Christmas. Beautiful! What an interesting concept! And they look really good too! My husband loves hot chilis and hot peppers – I think he’d really enjoy these! Candied chili peppers? Ranks right up there with chocolate covered ants! Oh well, to each his/her own! I am a chilli addict so will definitely be trying this out, thanks a mill!! Good to get the recipe, Kieran – I’ve been wanting to try these babies out for myself! Or how about a chili/chocolate combination? I’ll definitely be trying these – what would think about folding them into chocolate mousse? Remember when removing the seeds to take the membrane out too, it contains lots of the heat. 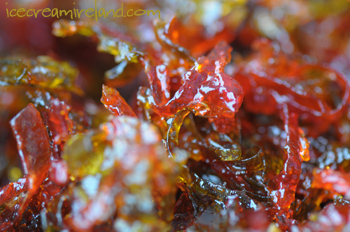 Loved the candied chilli recipe! I discovered that it still tastes great even if it does go brown in the oven – I got a bit distracted. The problem I have is how to get it into chocolate or ice-cream before it all gets eaten…. I had the same problem. We ate fistfuls of them! Thanks for the idea! I candied a habanero pepper to put on mango sherbet, and it was great. I loved the spicy syrup left over. I too was wondering whether candied chillies would be possible and I stumbled across this. I’m definitely trying this recipe over the weekend!